Overall the Porta-Bote provides just the right balance of portability, fishability, and excellent design. The Porta-Bote is a brilliant idea! But like any new idea it takes a bit of getting used to at first. Actually, the Porta-Bote isn't exactly a new idea at all. These craft have been manufactured in the United States, and sold around the world for over 30 years. Over which time almost 50,000 have been sold! They have also been around in New Zealand for some time as well, but chances are you haven't seen one yet. When the Porta-Bote first arrived by courier truck, I must admit to being a little concerned about how time consuming it was going to be to put together! I also wondered about the durability and toughness of a boat that could be folded into such a small package! We quickly removed the extensive packing and set about assembling the 12' 6" model on our front lawn. Having never even seen one before, other than in a photograph, we were delighted to discover that the whole job took little more than 15 minutes. With practice it was easy to see that this time could be reduced considerably. Disassembly took us just four minutes. The whole boat is locked together with stainless steel lockpins, bolts and wingnuts - you don't even need a spanner. As you can see in the pictures the Porta-Bote is put together by first "opening" the hull. It is spring-loaded to some extent, and so requires you to hold it open with your leg until you get the centre seat in place. According to the instructions, the Porta-Bote hull is stiffer in cooler weather and so requires more effort to open. With the middle seat in place it is a simple matter to bolt the transom inside the bladder, and then insert the two remaining seats. The whole business is simplicity itself. Even if you were no good at making model aeroplanes as a kid, I can promise you that you'll have no trouble at all with this. We couldn't wait to try the Porta-Bote out and were soon off to the Kaiapoi River. The Porta-Bote hull is designed to fold down to a package just 4'' thick, and so can easily be transported on a car roof-rack. Space saving on storage is another obvious advantage of being able to fold the Porta-Bote down to such a convenient package. It would be ideal for anyone living in a high-rise apartment, or townhouse, because it could be stored against the inside wall of your garage, or tied to the rafters, unlike a tinnie. You neighbours wouldn't even know you had a boat! Assembly at the Kaiapoi boat ramp soon drew a small crowd of interested onlookers. Our earlier practice on the front lawn paid off and we had the Porta-Bote together in no time flat. The hull itself weighs about 68lbs. When you add on the seats and transom, it was still light enough for two people to carry down to the water. You could also drag the fully assembled Porta-Bote on your own if you wanted to, though there is a handy two wheel Porta-Dolly available so you can get to "out of the way places" that you couldn't drive to. The hull is made from UV Buffered Copolymer Polypropylene 1/4" thick. The colour runs right the way through so any scratches don't show. This hull material is incredibly strong. It is unaffected by: sunlight, saltwater, acid, and won't even burn! Most importantly the hull is resistant to even the sharpest rocks that would puncture the hull of a tinnie! Once on the water it was soon obvious why Porta-Bote has been so successful over the past quarter century. It handles extremely well. It is a pleasure to row, even for someone as rusty as I am on the oars. The oars are foam filled to make them float if dropped overboard. During later "testing" on Lake Selfe, in the Canterbury high country, I soon came to appreciate just how easy this craft is to row. On this lake you're not permitted to troll with a motor so I had a go at rowing instead. The action of a lure when trolled behind a rowed boat is much more lifelike than when using an outboard. I hadn't rowed far when a giant rainbow erupted out of the water quite some distance behind us. I let go of the oars and gabbed for my rod. This big fish rocketed up out of the water several more times in quick succession before my lure snapped off at the knot. "Never mind," I thought, "there are plenty more in here!" And so it was, my son Stephen and I caught and kept a fish each as the evening progressed. At Lake Selfe we also discovered another important feature of the Porta-Bote: our muddy boots made an awful mess on the floor of the hull but this washed straight off later with the hose! The seats are covered with thick foam, as is the inside top of the hull. This material gives the Porta Bote considerably extra buoyancy. It will still float even when full of water. The foam covered seats are also very comfortable to sit on. Under power with our 5 hp Johnson outboard the 12'6" model flew along. The manufacturer claims speeds up to 20 mph with a 5 hp outboard. I don't doubt this for a second. It maintains excellent directional stability under power as a result of its deep keel design. It is also worth noting that it floats in just four inches of water. What a great boat this is. For me it is just ideal for fishing on lakes around the South Island. It is particularly suited to fishing Lakes Lyndon, Selfe, Georgina, Evelyn, Pearson, Taylor, and Katrine, in the Canterbury high country, were the regulations do not permit fishing from boats that are being mechanically propelled. The Porta-Bote enables access on these and other South Island lakes and rivers where otherwise shore access is difficult. The West Coast has many waters that features native bush to the shore line. At these places even the most modest craft is a huge asset. The Arnold River, and Lake Poerua instantly come to mind as being ideally suited to fish with the Porta-Bote. These delightful waters are almost unfishable from shore. Holiday anglers in the Marlborough Sounds could also make great use of a Porta-Bote for sea fishing. Wetting a line for a snapper just off shore is a very pleasant experience indeed! It would also be a great little craft for: whitebaiting, setting a mullet net, or as a ship-to-shore dinghy. You can even use it as a sailboat! The travelling angler will also greatly appreciate not having to tow a trailer everywhere they go, instead either carrying their Porta-Bote on a roof rack, or strapped to the side of their camper van. Some Canterbury anglers also use their Porta-Bote for salmon fishing. The method is to launch at the gorge, and drift downstream, stopping to fish likely looking holes on the way. I can't wait to give this a go myself. It would also be a good boat to cross the rivermouth lagoons when salmon fishing. The Porta Bote is ideal on the South Island lakes. Here a big rainbow trout has been caught on light spinning tackle while drifting and casting on Canterbury's Lake Selfe. The motor makes it easy to get to out of the way places down the other end of the lake. The Porta Bote is very stable. You can stand up to cast a line if you so desired. Assembly at the Kaiapoi boat ramp soon drew a small crowd of interested onlookers. Our earlier practice on the front lawn paid off and we had the Porta-Bote together in no time flat. Two anglers can carry the 12' 6" Genesis IV down to the water's edge. Our 5hp outboard pushed the Porta Bote along very well indeed. 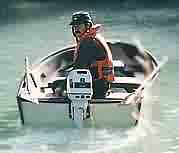 The manufacturer claims speeds up to 20 mph with a 5 hp outboard. I don't doubt this for a second. The Bote maintains excellent directional stability under power as a result of its deep keel design. It is also worth noting that it floats in just four inches of water. The Bote also slides easily across the grass making it possible for one person to launch and retrieve.